The rerun of the presidential election took place on 26th October, after a Supreme Court ruling on 1st September annulled the election results of the 8th August election. As previously reported on the CIVICUS Monitor, opposition leader Raila Odinga urged Kenyans to boycott the elections and a last-minute petition to the Supreme Court to delay the election failed to take place. A list of key incidents preceding the rerun of the election is available here. The controversial 26th October vote, marred by violence, controversy and a boycott, brought victory to incumbent President Uhuru Kenyetta with 98.2 percent of the vote, while only 39 percent of the registered voters turned up to vote. A Supreme Court ruling on 20th November upheld the election results, when the judges determined that the petitions to annul the results had "no merit". President Kenyetta was sworn in on 28th November..
As the deadline for filing petitions to the Supreme Court to dispute the rerun approached, the state NGO Coordination Board summoned three NGOs on 6th November- Inuka Kenya, Katiba Institute and Muhuri - to respond to allegations, among others, of operating without a proper license, employing foreigners without a work permit and money laundering. 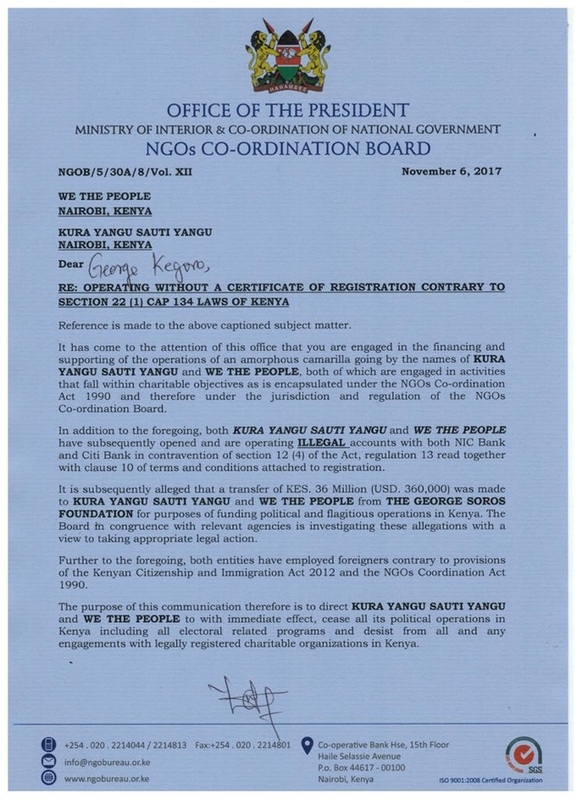 That same day, the NGO Coordination Board issued a communication directing Kura Yangu Sauti Yangu, a citizen-led coalition spearheaded by like-minded organisations, as well as We The People, a coalition of group of trade unions, civil society organisations, academics, media and citizens at large, to "cease all its political operations in Kenya and including all electoral related programs and desist from all and any engagements with legally registered charitable organisations in Kenya". The organisations were further accused of operating illegal accounts at NIC Bank and CitiBank, receiving funding from the George Soros Foundation and employing foreigners without a valid work permit. As reported previously on the Monitor, We the People issued a press statement on 23rd October stating that it would be impossible to hold free and credible elections on 26th October and demanding that the authorities call off the elections. In a separate incident, police officers arrested MP Embakasi East, Paul Ongili on charges of subversion and uttering abusive words against President Kenyatta for comments he made during an opposition rally on 25th September. On 28th November - Inauguration Day - police used tear gas and plastic bullets at a rally with main opposition leader Raila Odinga, thus preventing demonstrators from marching to the Jacaranda grounds in Embakasi, Nairobi for a prayer rally. Odinga then announced his own swearing-in for 12th December, claiming that the 8th August election had been rigged and he had actually won. "Political violence has surged with people getting killed every day. Yet again, we are getting worrying reports that police are using excessive force, beating and killing protesters and even those not participating in protests". According to Amnesty International, police killed at least 66 people in election-related violence since August, with at least 33 deaths in the aftermath of 8th August elections, while another three were killed during the October re-run. A joint report issued in November by the International Police Science Association and the Institute for Economics and Peace, ranked Kenya’s police force as the third worst in the world, with only Nigeria and Democratic Republic of Congo scoring worse. At least one person died on 2nd October during opposition protests in Siaya town, west of Nairobi, following a call from the National Super Alliance (Nasa) to push for reforms at the national electoral commission. The person is said to have died of shock after police used tear gas to disperse the protesters. Other opposition protests took place that day, with reports of police firing tear gas during clashes with demonstrators who lit fires and blocked roads in Kisumu in western Kenya, as well as anti-rioting police dispersing protesters in Kakamega. On 12th October, the government banned opposition protests against the national electoral commission in three major cities, Nairobi, Mombasa, and Kisumu, citing lawlessness as reason for the ban. On 28th September, clashes between the police and hundreds of protesting students from the University of Nairobi took place. Videos emerged later of security forces beating students in the halls of their dormitory and arbitrary detentions. The students were protesting against the detention of opposition leader Paul Ongili Owino. Following the events, administrators closed the university on 3rd October due to fears for students’ safety during another planned protest over the police's use of excessive force.